T.J. Miller is an actor and comedian appearing at The Funny Bone in Omaha, NE, from March 29th – April 1st. T.J. has appeared in well-known movies with actors such as The Goods: Live Hard, Sell Hard with Jeremy Piven, Unstoppable with Denzel Washington, and Our Idiot Brother with Paul Rudd, just to name a few. In November 2011 T.J. had a stand-up special on Comedy Central called No Real Reason. Backstage Entertainment sat down with T.J. in an interview before his first show of the weekend and asked him some questions about his acting and comedy. When asked which character name T.J. gets called the most when in public he said that it definitely had to be “Stainer” from the movie She’s Out of My League. Other notable characters he gets recognized for would be his role as “Tuffnut” in How to Train Your Dragon and “Billy” in Our Idiot Brother. T.J. also played lightning round with the “BSE Box” during the interview with Backstage Entertainment. At the end of the interview he gave the interviewer, Jeremy Lafrentz, a big hug which knocked over a table and broke a glass. Make sure to watch the interview at the link below and also a special clip of a bet he made with Joey Lafrentz, Backstage Entertainment cameraman. Photos from the interview are also linked below. 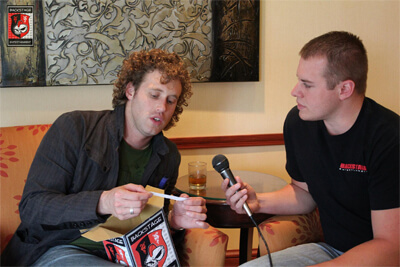 Make sure to go see T.J. Miller at The Funny Bone in Omaha and find him online at www.tjmillerdoesnothaveawebsite.com and “Like” his Facebook page at www.facebook.com/tjmillerfanpage.